Taiwan’s Nantou County is known for many things, but clearly the most important tourist attraction here is Sun Moon Lake. This highly photographed lake is responsible for drawing hordes of local and international tourists to Nantou. Sun Moon Lake is gorgeous for many reasons, and one of its unique features is that little island in the middle of the lake; that tiny island is Lalu Island. It is often referred to as “Island on the Water”. Originally called “Lalu Island” by the local Thao tribal people, it was renamed Guanghua Island (or “Pearl Island”) by the Nantou County Government in 1946 and hoped to develop it as a tourist destination within the popular lake. It was named “Pearl Island” because from the air, the island looks like a pearl necklace. Legends say that the pearl-structure used to be the peak of a mountain. However, the lake overflowed through the years, thereby submerging the mountain. It was also called “Yu Island” in earlier times. In October 1978, a Matchmaker Pavilion was built on the island and early visitors came to worship the Matchmaker god, praying for a husband or wife. The pavilion became a hit among young people who were seeking for their perfect match. Soon, a group wedding, the Shueishang Group Wedding, took place in the pavilion; it was participated in by several young couples. In 1999, the 921 Earthquake damaged the island and the Matchmaker Pavilion was removed and relocated to the nearby Longfong Temple. 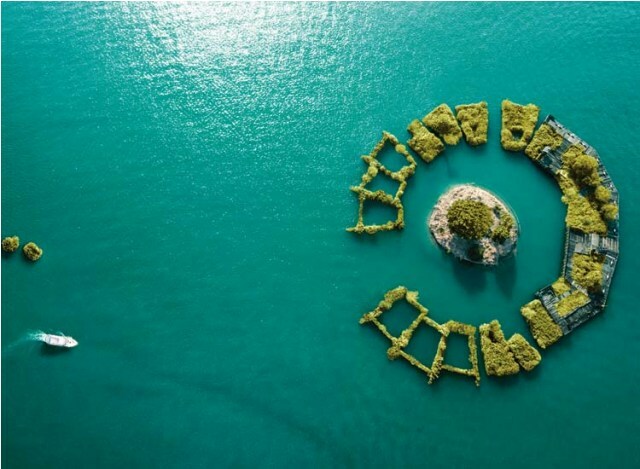 Also because of that huge earthquake that rocked the island and most parts of the country, the Thao settlers in the tiny island were granted renewed respect, and as a result, Guanghua Island was renamed “Lalu Island”. It was then declared by the Tourism Bureau’s Sun Moon Lake National Scenic Area Administration that the island is a sacred ancestral-spirit island of the Thao people and so, today, tourists are not allowed to visit. The Thao people do not live in Lalu Island. They now reside in the villages surrounding the lake. Only their witches and spiritual leaders go to the island within the lake in order to seek counsel and approval from the ancestral spirits at the island’s holy places. Only the island’s spirits can appoint a witch. Lalu Island is just one of the many mesmerizing natural attractions in Nantou County. Located at the very center of Taiwan, the county of Nantou does not have a beach to boast of. It is the only Taiwanese county that does not have a coastline. However, it is blessed with other attractions such as amazing peaks, hills, waterfalls and plains. It is often visited by hordes of mountain climbers, photographers and nature lovers.